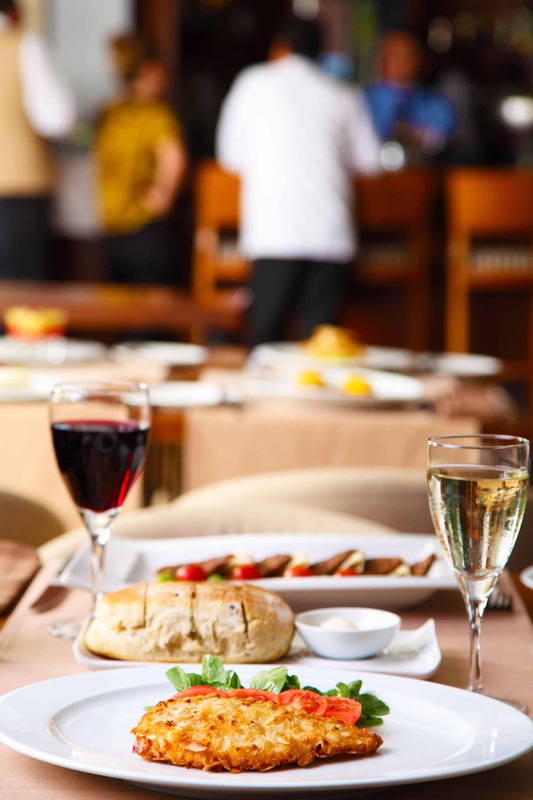 Check out our tips for how to save money on eating out if it’s killing your budget or you’d just like to save as much money as possible. Eating out is something that destroys a lot of budgets without people realizing it. When’s the last time you added up how much money you spent one month just eating out? Don’t feel alone if you find out you’re spending more money on eating out than even groceries. It easily adds up even if you’re spending less than $10 a meal when you eat out for lunch or decide you’re too tired to cook dinner and go out instead. It adds up even more if uncooked food and leftovers are going to waste in your refrigerator because of eating out. I’m not saying you should never eat out or feel guilty when you do eat out. I openly admit that I love food and trying new restaurants and dishes is a great joy of mine. Plus, there are some days I am just too tired to even pull a premade meal out of the freezer and warm it up. Sometimes you want to celebrate a special occasion or go out with friends that are rarely in town. But, that doesn’t mean you should throw money away just because. 1. Don’t drink your money away. Order a glass of water instead of soda and especially instead of beer or wine. Even though most places have free refills on tea and soda, these days beverages other than water easily add $5+ for just 2 people. 2. Share meals if possible. Here in the states, portions are usually large enough for 2+ people. So, most of the time it makes a lot of sense to share a meal, especially with kids. Younger kids and an adult can usually easily share a regular entree. Older kids could share a regular entree that may be cheaper than 2 kids meals. Do be aware that some restaurants may charge a plate sharing fee of around $3 – 5. 3. Go for appetizers instead. If you’re like me, you have a super tough time choosing what you want to eat. One of our favorite things to do is a get 2 – 3 appetizers for the two of us to share as our meal. That way we get to try a variety of things and the appetizers are usually cheaper than the entrees. 4. Don’t forget the leftovers. If you have a reasonable amount of food left, don’t feel weird at all about taking home the leftovers! Honestly, they’re one of my favorite lunches to have and I feel good knowing a got twice the bang for my buck by getting at least 2 meals for my money. 5. Utilize coupons. Coupons are a great way to save a few bucks when eating out. I find them especially good for breakfast and lunch. 6. Look for specials. Most restaurants have specials where you can find great deals at specific times to save a lot of money. For example, on Tuesdays, a local restaurant has fish and chips half off. I also love frapps from Starbucks but I only treat myself when they are half off or BOGO a few times during the year. If you love going out for beer and appetizers see if your local favorite has a happy hour or day when drinks are marked down. 7. Budget for eating out. I really think everyone should have a budget if you truly want to make sure you have savings and spend your money appropriately for your income. As such, make sure you budget for eating out in addition to your grocery budget. After you use your budget for eating out for the month, you don’t eat out again until the budget cycle starts over. 8. Choose cheaper options. Going out to eat doesn’t always need to be at a fancy upscale restaurant, especially if you’re just going out because you lack the energy to cook. Order off the dollar or value menu, especially if you’re looking for portion control. Chinese and pizza buffets are usually very budget friendly while offering something everyone will like. Remember, sometimes it’s more important to spend less money in total versus getting the biggest amount for your money spent, especially if the food may go to waste. For example, the 8-inch sub is cheaper overall than the 12-inch, while the 12-inch sub may be better for the amount of food per dollar. But, if you’re not going to finish the 12-inch, you’re just wasting money. 9. Only eat out on special occasions. I like to look at eating out kind of like eating dessert. I love doing both but I know it’s something I need to limit. So, we try to limit eating out, especially at nicer restaurants, for special occasions. Some of these include birthdays, anniversaries, career promotions, and life achievements. 10. Get takeout. One of the biggest ways we save on eating out is that we usually get takeout. Some restaurants even have family-sized meals ready to go. Sure, you don’t get the experience of having everything brought to your table but you save a lot of money by not having to buy drinks or tipping. And, you still get the benefit of not having to cook and minimal cleanup. 11. Consider take and heat options. Okay, so you may not technically be going out to eat with this option. But, if you don’t mind taking the time to put a meal in the oven or skillet with minimal work, take and heat options can be a lot cheaper than eating at a restaurant. Lots of grocery stores have both refrigerated and hot meals. Some of our favorites are rotisserie chicken (our favorite is Sam’s Club) or fried chicken and loaded baked potatoes, ready to bake pot pie, already formed burgers ready to cook with all the fixings, etc. 12. Look for discounted gift cards. Places like Amazon (look for lightning deals), Groupon, and Restaurant.com will feature discounted gift cards and certificates to both chain and local restaurants. Also look for deals straight from your favorite restaurants around holidays. They’ll often have special deals where you get a free $5 – 10 gift card when you buy a certain amount of gift cards otherwise. What are your tips for how to save money on eating out?